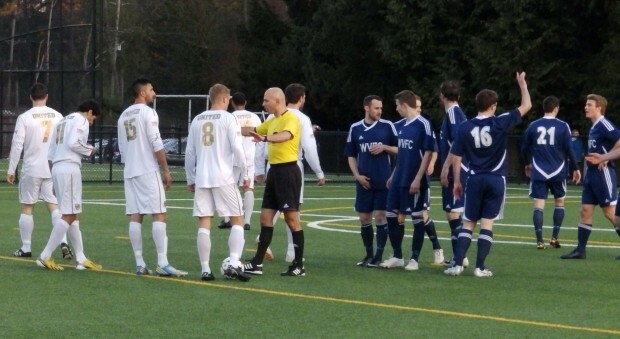 The 2014 BC Provincial A Cup got underway in some style in West Vancouver on Friday evening with a seven goal cracker between Vancouver Metro Soccer League (VMSL) rivals West Van and CCBRT United. With four goals scored in the last 11 minutes of play, West Van battled back from being two down at half time to run out 4-3 winners in a pulsating cup tie that had a bit of everything. Only a red card and a dog on the pitch was missing. Some people have wondered why do we put so much time and energy into covering the Provincials on AFTN. A match like this pretty much explains why. It was entertaining and action packed from start to finish and was a great advert for the local football scene in BC. Plus we love Cup ties! It was always going to be a close affair, with West Van edging out CCBRT to win the 2013/14 VMSL Premier Division title by a single point. There was a little edge before the kick off with West Van demanding that United keeper Luke O’Shea change his yellow top as it clashed with the officials. After finally wearing down the referee, the change to purple wasn’t much better as it clashed with the dark kit of the home side. When the teams met in the penultimate league game of the season last month, West Van ran out comfortable 3-0 winners, but any thoughts of a similarly one sided result in this one was soon put to rest when Whitecaps Residency alumni Derrick Bassi put the visitors into the lead after only three minutes with a stunning long range strike from 25 yards out that gave West Van keeper Marco Durante no chance. His Caps PDL teammate Harry Lakhan forced Durante into a save with a long range shot of his own ten minutes later and although the West Van keeper spilled the effort, he was quick to recover. The home side went up the pitch and seemed to be trying to walk the ball into the net, eventually winning a corner. Robert Giezen’s goalbound shot from outside the box was deflected clear and as the ball was played back in, Leo Nash headed into the outstretched keeper’s arms. After a few chances, CCBRT doubled their lead just past the midway point of the half when a break up the right saw the ball played across the West Van goal and with Durante committed and out of position, Riley O’Neill, who plays the PDL season with Victoria Highlanders, was unmarked and had the easy job of hitting home for 2-0. The goal sparked West Van, who pushed hard to get a goal back. Jesse Fetterley had a shot saved, then later sent a great ball across goal that should have been buried but there were no takers for the home side. With the half coming to a close Robert Giezen sent a curling effort just past the top corner of O’Shea’s near post. CCBRT went into the half two goals up and looking like they had the tie in the bag, but full credit to West Van who came out for the second half all guns blazing and it was one way traffic as the United goal came under constant attack. It felt like a goal was coming for the VMSL champs any minute and they eventually got one back nine minutes into the half in a move started and finished by Cathal O’Connor. O’Connor played a free kick into the box and after some nice footwork by Corey Birza, Alan McIndoe backheeled the ball back into the path of O’Connor who ran in to score low past O’Shea and give the home side hope. The visitors were basically removed as an attacking force for most of the second half and were forced to sit deep and defend. As West Van pushed, there was a bizarre incident when Devan Woolley looped a header towards the goal, and as the ball hit off the post, O’Shea ran into the goal and it moved off it’s line. With the home side appealing for a penalty, free kick or anything, the referee gave a corner. The home side had more chances and it felt like the equaliser was inevitable. It came in the 79th minute. Giezen looped a header goalbound and as a couple of players went for and missed the ball in the six yard box it took a bounce into the path of O’Connor and he headed the ball past the keeper and a defender on the line to tie things up. It was no less than West Van deserved and it now looked like there was only going to be one winner. Four minutes later and West Van took the lead when Giezen drilled home a penalty after a barge in the box and it looked all over for CCBRT. O’Connor had a near miss a minute later and the home side were punished when the visitors levelled things up again from nowhere in the 85th minute. Former Toronto FC player Nick Soolsma made room for himself in the box and clinically finished past Durante. As extra time beckoned, West Van completed their fightback in the final minute. CCBRT didn’t have much time to mount any comeback of their own this time, and Tachie nearly grabbed his second when he showed great skill to skip past two United defenders before hitting inches past the left hand post in the final seconds of stoppage time. And that was that. CCBRT will be kicking themselves at letting this one get away from them, but West Van’s fighting spirit showed why they were VMSL Champions this season. You can see highlights of the game (including six of the goals) below and photos from the match are on our Flickr page. West Van will now play host to VMSL side Croatia FC or FVSL’s Abbotsford Magnuson Ford United in the quarter finals. In Friday’s night’s other match, BMSA Champions South Burnaby Fighting Irish march on in the B Cup with a 2-0 win in Richmond over RASA team Rain City Rangers. They will now face either another Richmond side, Jugadores CF, or an all BMSA match up against Bacardi FC in the quarter finals. There’s still lots of matches set for the rest of this weekend, so check out the full schedule and get out and #SupportLocalSoccer. We’ll bring you more coverage here on AFTN over the next two days.